Dals are a staple diet of people in the punjab. Nearly every kind of dal is grown and cooked here. 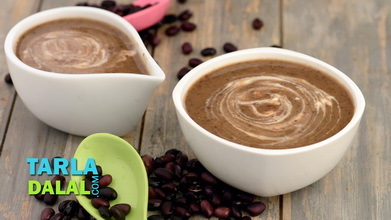 In most households the meal is incomplete without at least one dish made with pulses. 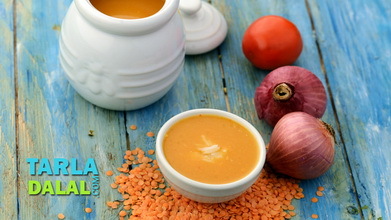 The yellow moong dal or split yellow gram is very popular in punjabi cooking. This dal requires minimal soaking time and is easy to cook. 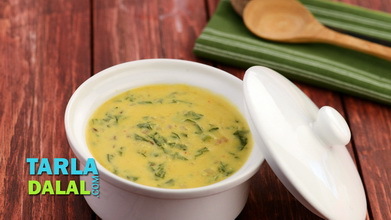 Here is a lovely shorba made with the much loved yellow moong dal. The use of green chilies and chilli powder makes it a spicy treat though you can adjust the spiciness according to your preference. 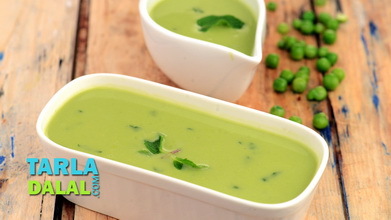 You can add any chopped boiled vegetables to this shorba and make it a healthy treat for the whole family. 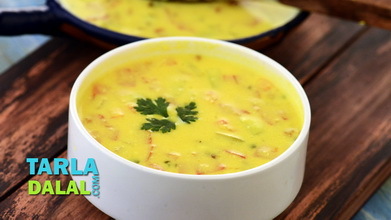 Clean, wash and soak the yellow moong dal for 30 minutes. Drain. Combine the dal, onions, tomatoes, green chilli, chilli powder, ginger, turmeric powder, garam masala, salt and 2 cups of water, mix well and pressure cook for 3 whistles. 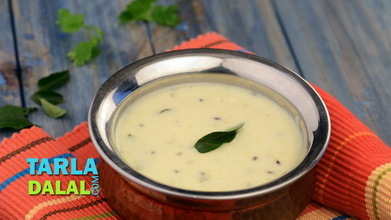 Heat the ghee in a deep kadhai, add the garlic and sauté on a medium flame for a few seconds. 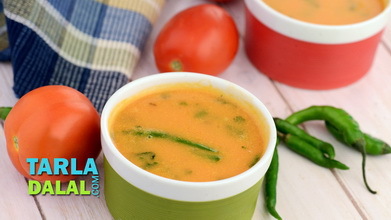 Add the cooked moong-dal mixture and 1 cup of water, mix well using a whisk and cook on a medium flame for 1 to 2 minutes. 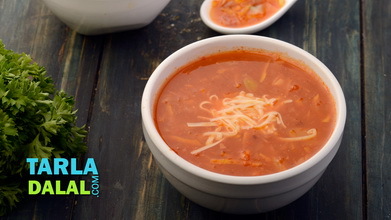 Add 1 more cup of water, mix well and cook on a medium flame for 3 to 4 minutes, while stirring occasionally with help of a whisk. Finally discard the green chilli. 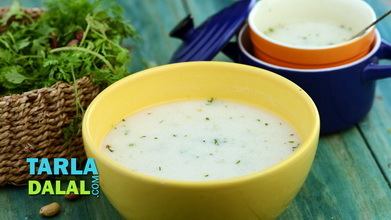 Serve hot garnished with a sprig of coriander.